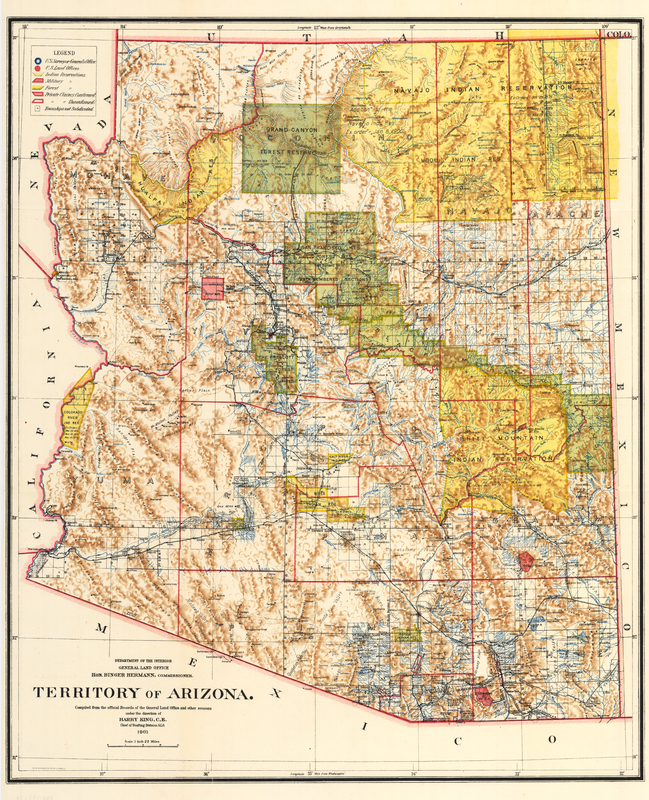 This is an authentic, antique map of the Territory of Arizona. The map was published by the General Land Office of the United States as part of an annual report for the department of the interior in 1901. A colorful and fascinating map with great detail issued eleven years before statehood. The extent of nine Indian reservations and at least three Military reservations, including Camp Apache, are clearly shown in different colors. Numerous confirmed and unconfirmed land claims are named and located. A huge Grand Canyon Forest Reserve is shown. The brown mountain areas and the blue waterways combine to provide great visual impact. Information includes watershed, mountains, railroads, wagon roads, private claims, un-surveyed townships, etc. Condition: This map is in A+ condition, issued folded without any separations or holes. The map presents rich color and clean paper.